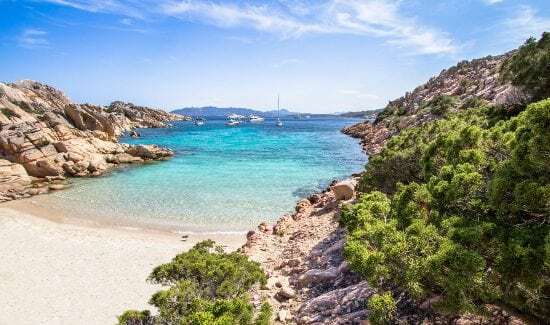 Why choose the Costa Smeralda? With its rose-red beaches and crystal-clear waters, Mediterranean vegetation, intense colors and unmistakeable aromas, the Maddalena archipelago is an inland area with a wealth of history and charming traditions, all spiced up with a touch of glamour, elegance and good times. The Costa Smeralda is the perfect combination of all these elements – why hesitate when imagining your dream wedding. The area offers so many different alternatives: luxury boutique, or offbeat, alternative hotels on unspoiled beaches; camping and mini resorts that look like charming oases located on the granite mountains hanging over a sea of silver. Here, the most refined and intimate surroundings merge, without ever sacrificing the purest Mediterranean style which sets the area apart. Accommodation for you and your guests can be found in beautiful, especially reserved private villas; at boutique hotels tucked away in unexpected, hidden corners; or at a stazzo, an authentic Sardinian farmhouse. Get the festivities started with a beach party, or a wine tasting party in a charming vineyard, where you’ll have the chance to taste the best of local food and wine, allowing yourself an experience that indulges all five senses! Imagine your ceremony on the white sand at sunset… A ceremony that will be intimate, elegant and unique. A religious ceremony in the local village church, in perfect Italian style, followed by a reception in the square, under the oleanders in bloom, laid out in such a way as to marry nature with refinement. The menu and table service will be impeccable, and after the reception you’ll be able to let loose and celebrate long into the night. And for those who love the life of a classic vita smeralda socialite, we can organize an after-party at one of the trendiest bars in Porto Cervo. After the wedding, if you want to bid farewell to your guests with an original and surprising offering we can organize Safari boat tours, revealing the most astonishing parts of the La Maddalena National Park, complete with treasure hunts, diving, power yoga sessions, relaxing massages and picnics on the beach.